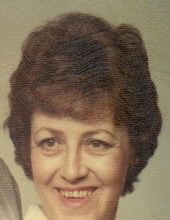 Dale (Cramer) Swanson, age 77 passed away surrounded by the comfort of her loving family on Monday, January 21, 2019. She was the daughter of the late Donald and Thelma (Young) Cramer and wife of the late Philip Swanson. Dale was born on June 30, 1941 in Providence, RI and was a graduate of Norwood High School. She was employed for many years at the former Codex Company. She loved camping, knitting and crocheting. She most enjoyed time spent with her family. She was a loving and devoted wife, mother and sister. Beloved mother of Lance Haltom of Foxborough. Loving sister of Heidi Sallie of Foxborough, Paige Cramer of SD and the late Brad Cramer. Also survived by many nieces and nephews and many great nieces and nephews. Relatives and friends are kindly invited to attend calling hours on Saturday, January 26 from 1 to 4 PM at the Roberts and Sons Funeral Home, 30 South Street, Foxborough. For additional information please contact 508 543-5471. To send an on line condolence please visit the funeral home web site at www.robertsandsonsfuneralhome.com. In lieu of flowers, donations in Dale’s memory may be made to Parkinson’s Disease Foundation, 1359 Broadway, Suite 1509, New York, NY 10018. "Email Address" would like to share the life celebration of Dale Swanson. Click on the "link" to go to share a favorite memory or leave a condolence message for the family.